The convoy of three coaches set off. No sooner than they set off Den got a message would he switch on the speaker system and then could Maria speak to everybody on all the coaches at the same time. The M18 joined the M62 at or near to Ferrybridge. 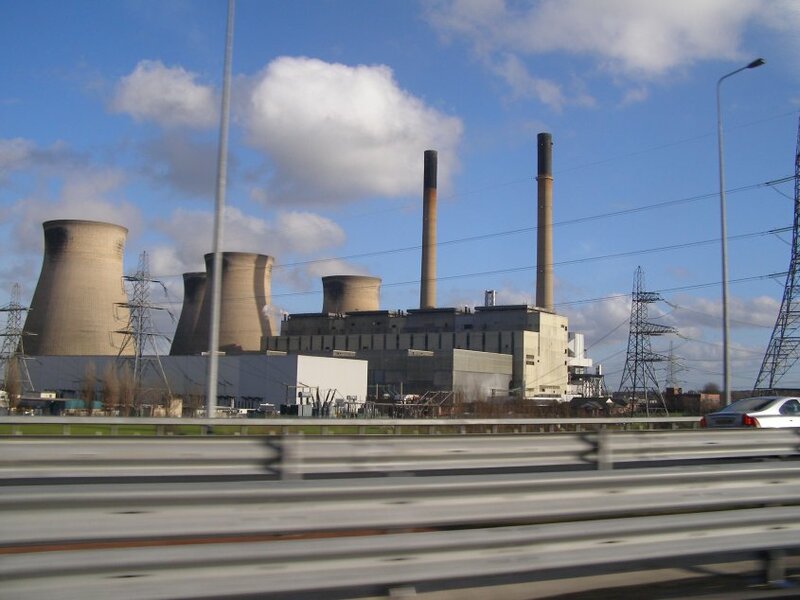 Shortly after joining the M62 the coaches passed the massive power stations of Eggborough and Drax. These monuments to industry were still belching out steam and fumes. They passed the site of the former Glass Houghton mine, which is now a shopping complex. Nena pointed out Escape and informed the clients that it was an indoor ski & toboggan slope. While across the road was a shopping village selling discounted goods. Kat introduced the girls and then Nena introduced Jools and Maddy. Jools told the girls how Nena had ended up in period costume and showed clients around Maria's home. This brought considerable laughter from the girls. They finished their breakfast and went outside. They raced each other to the top with Kat coming first. They stood watching the traffic going over the bridge and took a few photographs. Then it was down those steps again. Nena was the last to leave. “Not exactly a medical but you both could do with seeing our team psychologist. Yes Nena I know about you. In fact I had a complete check done on you and Jool's. Gabriel I presume it was you in the toilet that overheard what I said? Nena, “We both understood you although it was a mixture of German and English. Godfrid pointed to a bike with number six on it. “Das ist Nena's und das ist Gaby Bond.” Gaby looked at the bike and lifted it up. “Wow it is carbon fibre. If I am one and you are six then the others must be in between us.” Gaby got on the bike and Godfrid made a few adjustments. He then did the same with Nena. There were several squeals as the girls discovered a waterslide. Nena started to do some lengths and Maria tagged on. “You like to do lengths do you run as well? Gaby and Kat took a hand each of Nena's, “Please accept we need you.” They were interrupted by a voice. Godfrid switched his Sat nav on. “No need for that Godfrid I live just outside York and it should take us about an hour to get there.” After they had finished they set off on the duel carriageway to York. They stopped at the car rental place and handed the car back paying up what was needed. Then he took over the driving from Godfrid. Godfrid and his new partner left with the paintings. They set off for the return trip to Scarborough. 45 minutes later they pulled up outside the Royal hotel in the town centre. Somebody came out and directed them to an underground car park. They collected their key and found they where sharing a room. They both had a quick wash and then went looking for the dining room. The Royal Hotel is situated opposite the town hall on top of a very high cliff and over looks the North Sea. There are tiered gardens in front of it that lead to the beach. There is a lift that takes people down to the beach. In the dining room they discovered all the meals where serve your self. They had to go to the food bar and select what they want. Likewise they went and got what the wanted to drink. Bill though only took orange juice.